１. Hydrangea Tea is “Buddha’s Pleasure”. 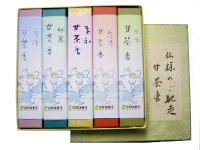 Hydrangea Tea incense is often used to celebrate birth, and the tea is a favorite drink of one’s ancestors. It is a treat to Buddha when, with a true heart, you offer the Hydrangea Tea as repayment for kindness and thankfulness. 2. The Hydrangea Tea Aroma helps clear the mind of misfortune. When your mind is clouded with a sense of misfortune, the Hydrangea Tea scent will help dissipate that feeling. Hydrangea Tea has been known for its healing properties, which relieve tension and promote longer life. In New Year’s Eve ceremonies, a bell is rung at night and the hydrangea fragrance is use to wash away the calamity of misfortune which has accumulated in your heart throughout the year. It allows you to focus on the good things that have happened recently and “wash your heart” of the hateful things that are not part of your spirit. Once completed, you should rejoice in a healed, lean, eternally happy and humble heart. It registers in the favorite. １. Hydrangea Tea is “Buddha’s Pleasure”. 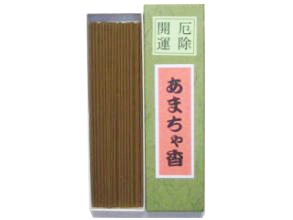 Hydrangea Tea incense is often used to celebrate birth, and the tea is a favorite drink of one’s ancestors. It is a treat to Buddha when, with a true heart, you offer the Hydrangea Tea as repayment for kindness and thankfulness. 2. The Hydrangea Tea Aroma helps clear the mind of misfortune. When your mind is clouded with a sense of misfortune, the Hydrangea Tea scent will help dissipate that feeling. Hydrangea Tea has been known for its healing properties, which relieve tension and promote longer life. In New Year’s Eve ceremonies, a bell is rung at night and the hydrangea fragrance is use to wash away the calamity of misfortune which has accumulated in your heart throughout the year. It allows you to focus on the good things that have happened recently and “wash your heart” of the hateful things that are not part of your spirit. Once completed, you should rejoice in a healed, lean, eternally happy and humble heart. 3. Eternal Happiness from the Hydrangea Fragrance. The hydrangea fragrance grants you the courage and happiness to overcome what we all find difficult to confront. It is considered an important part of the road to a person’s paradise, and lifts your appreciation of the happiness of the “pure land”, including praying. Often referred to as the “heart of mercy which rejoices in the joy of others” the hydrangea fragrance represents sincerity and a blossoming of eternally beautiful happiness, which you achieve when your good conduct toward others is repeated. “USE CARE WHEN HANDLING INCENSE” Please read before you use this incense Do not take internally. Please be careful when handling fire or burning incense.>Do not place burning incense near any flammable gas, liquid, object, or surface. Please use a non-flammable incense burner/holder or similar container to catch burning ash. Please keep out of reach of small children.To safeguard the original quality of the incense stick, please avoid storing in high temperature or high humidity.Please make sure the incense has completely finished burning, and is out, before you leave the room. - Fire extinguishment hydrangea tea smell lantern. It is said that it happens to the mind because of the history, the fire of the evil passion that burns brightly is flushed, and it is extinguished though the seen one, the heard one, the eaten one, the smelt one, and the skin are touched ･･･. To the thing of the incense stick and the smell ･･･ The update on February 2, 2010. It is a mind that entertains the incense stick and another though thinks knowing. １. Hydrangea Tea is “Buddha’s Pleasure”. It is priming at the time of build a new nest with the married couple for 14 days April in 2009 fiscal year ･･･ Clay is not dry yet either. It is serious that the living thing builds the house. Swallows came to Awaji-Baikundou of the incense stick hydrangea tea smell of the favorite dish warmer it or earlier than ordinary years this year, March 17 in 2009 fiscal year, this year the offering of the incense stick, the smell, and the buddhist service. It might give birth to a lot of children this year ･･･ How many parents build the nest this year though about four parents come and the nest was built last year? 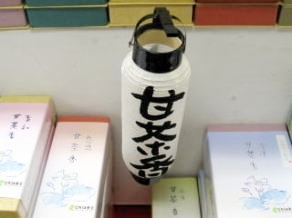 It matched in a cheerful manner and the swallow came to the incense stick office of Awaji [umekaodou] about the spring March 22 in 2008 fiscal year. The nest might be increased from now and it bring children into the world ･･･. 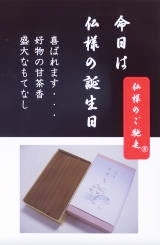 The incense stick smell every year: 【 happy swallow 】 comes and it rears children to the office of Awaji-Baikundou. [Oyatsubame] that seems to be happy doesn't have the difference by the goddess of mercy who reports, "It is happy when the incense stick's thinking about other party's because of no me thing".